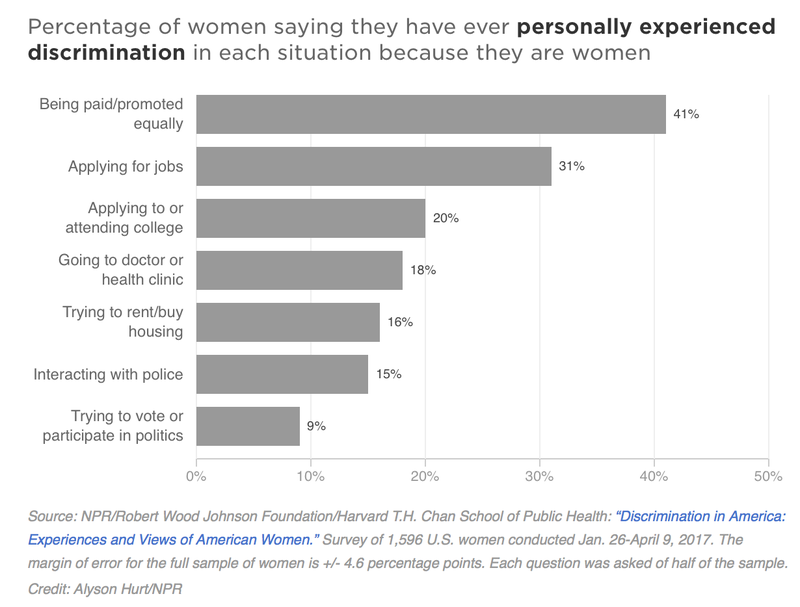 Discrimination in the form of sexual harassment has been in the headlines for weeks now, but new poll results being released by NPR show that other forms of discrimination against women are also pervasive in American society. The poll is a collaboration with the Robert Wood Johnson Foundation and the Harvard T.H. Chan School of Public Health. For example, a majority (56 percent) of women believe that where they live, women are paid less than men for equal work. And roughly a third (31 percent) say they’ve been discriminated against when applying for jobs because they are women. Overall, 68 percent of women believe that there is discrimination against women in America today. The chart below shows that the experience of gender discrimination is not monolithic — women in each racial, ethnic and identity group have particular problems in employment, education, housing and interactions with law enforcement, the courts and government. Several groups of women also avoid seeking health care out of concern they will face discrimination. On nearly every measure, Native American women had the highest levels of discrimination based on gender. In our series, “You, Me and Them: Experiencing Discrimination in America,” we have highlighted several of these situations, including unfair treatment by the courts in majority-Native areas. NPR will livestream an expert panel discussion on Native American issues at noon ET on Tuesday. One of the patterns that emerged from the poll and our subsequent reporting is a gulf between high- and low-income areas when it comes to experiences of discrimination. This gap is also apparent in the gender data crunched by our Harvard team. 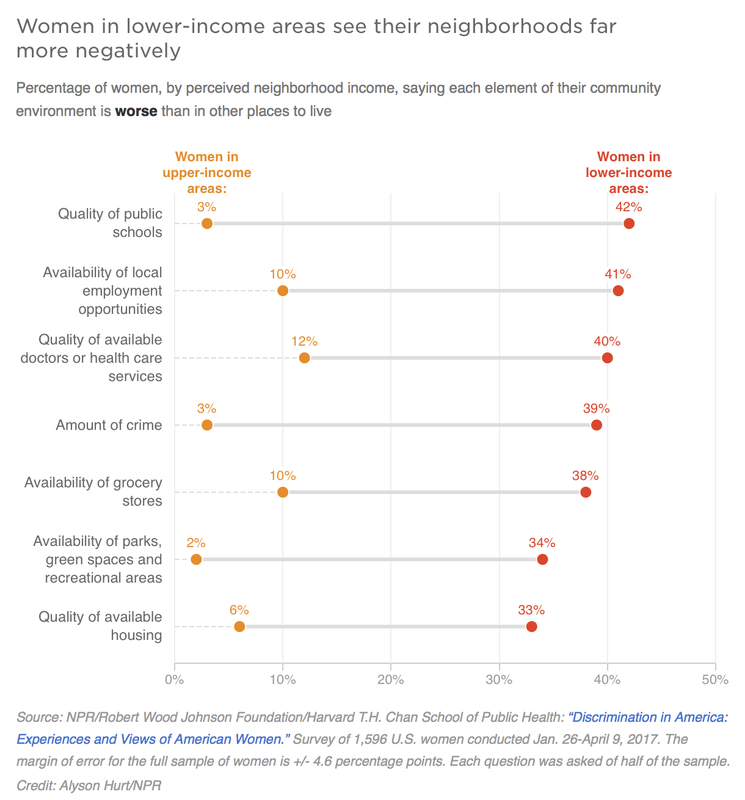 The graph below illustrates the stark differences based on income when it comes to several everyday experiences people have in their own neighborhoods. Our poll — which was fielded from late January to early April — before this fall’s intense news coverage of sexual harassment — also captures what women were feeling and experiencing before the recent scandals. We found that 37 percent women overall reported they or a female family member had been sexually harassed because they are women at some point in their lives. 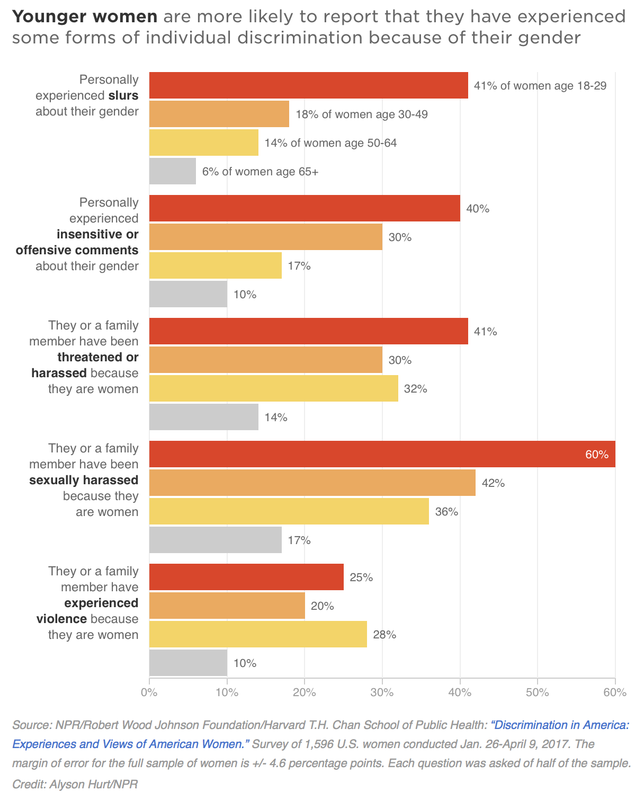 But there was a wide range of responses based on age, with 60 percent of those 18 to 29 years old saying they or a female family member had been sexually harassed because they are women, versus 17 percent of women 65 and over. The survey from NPR, the Robert Wood Johnson Foundation and the Harvard Chan School was conducted from Jan. 26 to April 9, 2017 among a nationally representative probability-based telephone (cell and landline) sample of 1,596 women. The margin of error for total female respondents is 4.6 percentage points at the 95 percent confidence interval. 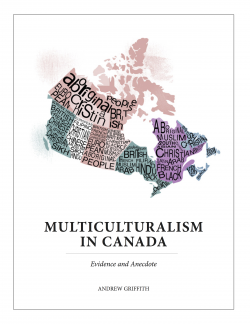 Complete methodological information is in the full poll report.